Two Canada Geese parents take their seven goslings for a swim amongst the marsh reeds growing along the shoreline of Lake Erie in Point Pelee National Park in Leamington, Ontario. These goslings are not able to fly on their own yet, but this is a natural behavior which these birds can do around 9 or 10 weeks of age. 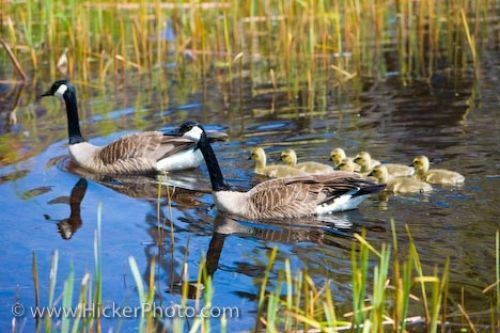 The parents are very protective over their goslings and if any sign of a threat is near, these adult Canada Geese can become quite mean. After the spring migration, the goslings will be old enough to take flight on their own and during their second year of life, they will seek out their own mate and become parents to their own goslings. Canada Geese usually remain with the same mate throughout their life unless a tragic accident happens to one or the other. The female will lay between 3-8 eggs and both parents will watch over the nest during incubation to protect them from any unwanted animals. Picture of the parents of seven Canada Geese goslings in the weeds growing along the shoreline of Lake Erie in Ontario, Canada. During the spring, the Marsh Boardwalk in Point Pelee National Park is the ideal location to watch various bird species tend to their young along the shoreline of Lake Erie.